Jelonzo (Japanese: エチゼン Echizen) is a blue jellyfish who owns Jelly Fresh, a clothing store in Inkopolis. Along with Jelfonzo, he is one of the two known jellyfish able to communicate with Inklings. Jelonzo is a blue jellyfish who has black rhombus-shaped eyes. Jelonzo wears a purple and white mesh cap and a black scarf with big blue dots. He alternates between four different tops, one top being white with a blue, purple and pink fuzzy object and an eye in the middle, the second top being black with a neon green jellyfish in the centre, the third is white with an orange skull and white tentacles coming out from the bottom and the fourth one is orange and grey emblazoned with several white jellyfish which appear to look like Goombas from Mario games. Jelonzo is the charismatic clerk that runs the clothing shop. With his uncanny sense for the hottest trends, he is viewed as a fashion god of sorts by all the young squids in town. He hails from distant waters and has a strange way of speaking that can make it difficult to understand him, but that may be one of the secrets to his success. Aside from his awkward grammar, he also is known to say "BLUUH" from time to time. This may be common to jellyfish (as an onomatopoeia referencing their squishiness), or it could simply be another of Jelonzo's quirks. 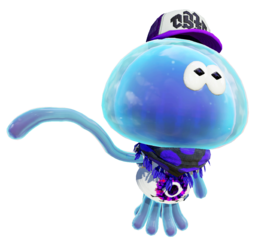 Separating Jelonzo from the common jellyfish is his skin color: while other jellyfish have blue-green skin, Jelonzo's is a pure blue with a purple tinge in some areas. It also seems to glows slightly, which has been confirmed by Callie; she often mistakes him for a "glowing ghost", as seen in one of her comments on Bluefin Depot. Other jellyfish may also have this ability, as all jellyfish in Inkopolis Plaza give off a very faint green glow during a Splatfest. Jelonzo's version of DJ Lee Fish's song Lookin' Fresh is faded out except for the melody, the "center", because his gear goes on the middle part of the body. It also has many bubbly sound effects in the background, showing his bubbly and ecstatic personality as well as referencing his gelatinous species. Unlike the other shop keepers, Jelonzo's appearance is not constant, as he wears one of four different shirts each day. However, his scarf and hat remain the same. "Jelly Fresh! Thanking fo- BLUUUH! A fashion crime is in the progress! Moldy customer is moldy. Jelonzo is in the great shock! Level 4 is being required. You are needing more of the fresh for the shopping! Play regular battle in lobby for the freshness, yes? Then again visiting please." - When a player below Level 4 enters the shop. "Jelly Fresh! Thanking your visit. Buy Jelonzo's clothes to become full of the confidence! Abilities are being inside of the gear items. Information is living in manual. Press for the reading, yes?" - When a player at Level 4 or higher enters the shop for the first time. "Jelly Fresh!" Thanking your visit. You have the new freshness! Please to the buying of the body cloths!" - When a player enters the shop upon reaching Level 5. "Jelly Fresh!" Thanking your visit. You are now having the extreme freshness! Shop of my great qualities!" - When a player enters the shop upon reaching Level 15. "Jelly Fresh! You are having the freshest of levels! Jelonzo is selling you the body cloths of the dreams!" - When a player enters the shop upon reaching Level 20. "Thanking for your visit, but you are being the offline! Require Internet connecting before the shopping." - When the player is offline. "Please to the shopping!" - When the player enters the shop. "You want buying?" - When the player selects a piece of clothing. "And equipping?" - When the player purchases a piece of clothing. "Thanks for the buying! You are touching the for equipping of your gears." - After the player chooses whether to equip a new piece of clothing. "You are already owning that body cloth!" - When the player tries to purchase a piece of clothing they already own. "This is being the awkward… You are needing more of the monies." - When the player does not have enough Cash. "BLUUH. Cloth changing unpossible during the festival of the splat. Please to understanding." - When the player tries to equip a piece of new clothing during a Splatfest. "Jelly Fresh! Thanking fo- BLUUUH! A fashion crime is in the progress! Moldy customer is mold. Jelonzo is in the great shock! Level 4 is being required. You are needing more of the fresh for the shopping! Play regular battle in lobby for the freshness, yes? Then again visiting please." - When a player below Level 4 enters the shop. "Jelly Fresh! Thanking your visit. Buy Jelonzo's clothes to become full of the confidence! Abilities are being inside the gear items. Information is living in manual. Press for the reading, yes?" - When a player at Level 4 or higher enters the shop for the first time. "Welcoming shop you!" - When the player enters the shop. "You buying do?" - When the player selects a piece of clothing. "You equip do?" - When the player purchases a piece of clothing. "Always great thanks! For gear change touch Equip select on , you knowing this yes?" - After the player chooses whether to equip a new piece of clothing. "No, no, buying no. Clothes of select owned currently! Cannot taking monies for purchase of pointless!" - When the player tries to purchase clothing they already own. "Buying thanks, yet time is Splatfest, thus clothes change unpossible. Please to understanding!" - When the player tries to equip a piece of new clothing during a Splatfest. (This is Jelly Fresh, thanking for going in shop. ...No, you are confirmed dirty. Your fresh is incomplete, can not help being surprised, real bad. Come to fresh, then you are come to shop. Because quickly Level 4 is good as you getting fresh. Getting your level up is so repeating the Turf War from the lobby, have a good time. ) - When a player below Level 4 enters the shop. (This is Jelly Fresh, thanking for going in shop. Buy clothes, and you are full of confidence and win. The clothes of my shop are gear for fresh squid, which has gear abilities. In detail is , push 「？」, check instructions is real good!) - When a player at Level 4 or higher enters the shop for the first time. (Of welcome.) - When the player enters the shop. (You are buy?) - When the player selects a piece of clothing. (You are equipment?) - When the player purchases a piece of clothing. (Always okay is thanking! In replacing gear, touch for customize.) - After the player chooses whether to equip a new piece of clothing. (Clothes are own, you cannot buy.) - When the player tries to purchase clothing they already own. (Customer, money of not enough.) - When the player does not have enough Cash. (Thankings! During the Splatfest is change clothing is impossible, but stay fresh.) - When the player tries to equip a piece of new clothing during a Splatfest. Jelonzo's name comes from the word "jelly," as he is a jellyfish. Jelonzo's Japanese name is "Echizen" and Jelfonzo's Japanese name is "Bizen"; both are names of historic provinces of Japan. When switching to Jelly Fresh from another shop, Jelonzo can be seen with his tentacle stretched towards the rack of shirts on the back wall for an instant. This is possibly a protective gesture, as the shirts are shaken up when switching between shops. None of the shirts Jelonzo wears are available to the player as gear. Jelonzo is the only shop keeper in Splatoon that does not return in Splatoon 2; Sheldon keeps his job, Crusty Sean runs the Crust Bucket, and Annie owns the SplatNet store, but Jelonzo is absent. Jelonzo's reaction to the player not having enough Cash. Jelonzo stretching out his tentacle when switching to Jelly Fresh. Three yellow signs with a drawing of Jelonzo in them, found in the Plaza. They appear to be ads for Jelly Fresh. ↑ Famitsu:『Splatoon（スプラトゥーン）』開発スタッフインタビュー【デザイン編】 (Splatoon Developer's interview Design article). ↑ Post from US Splatoon Tumblr. This page was last edited on 10 March 2019, at 01:41.